At Harlequin Fun Casino, we have luxurious, authentic full size casino tables to hire for parties, weddings, functions and events. Our casino tables have been made to the very highest specification, and are just like the casino tables you would find in a real casino. We have made every effort to ensure that our mobile casino service is as authentic as possible, and we’ve paid attention to the smallest details to give our clients and their guests a really realistic casino experience. We’ve gone to unique measures to give you an authentic Las Vegas Casino experience. All of our playing cards have actually been used in play on the Blackjack tables in some of the best casinos on the Las Vegas Strip. Our playing cards come from The Bellagio, Caesars Palace, The Flamingo and Planet Hollywood to name only a few. When we say authentic, we mean authentic! Our fun casino tables are always immaculately presented and are re-upholstered regularly to give them a fresh new appearance at all times. 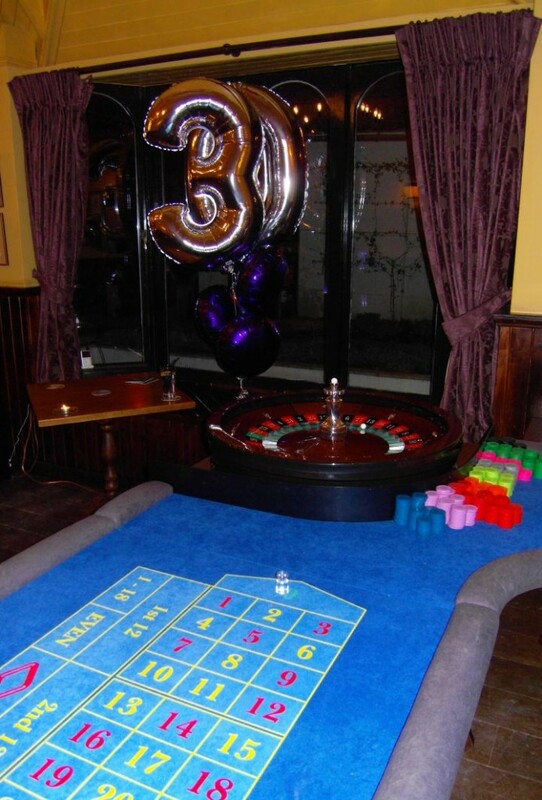 You won’t find any rips, tears or ‘patch-up’s on any of our casino tables, which makes them ideal for high-end functions and weddings where perfection and attention to detail is of paramount importance. Perhaps the most impressive aspect of our casino equipment are our full size Roulette Wheels hand finished in Mahogany and Rosewood and very striking and imposing. It’s the sheer size of the roulette wheels that really makes the casino experience come alive, especially for those who have never seen one up-close before. Most people don’t expect them to be so big and grand, and they certainly turn heads when they are set up in a room. All of the casino table images you see on this website are exclusively ours, hand finished, made to order and cared for extremely well. We’re always complimented by clients, guests and staff at hotels, golf clubs and venues who see our tables for the first time and are genuinely impressed by the quality of our equipment, which is always lovely to hear!